Margarete Naumann was born in Chemnitz, which is near Dresden in Germany in 1881. 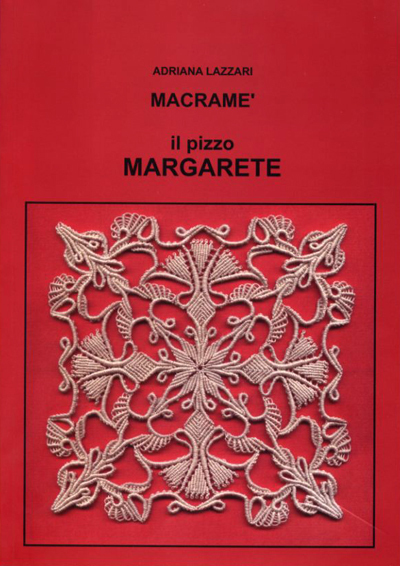 She invented and then taught what is known as Margarete lace in the early years of the twentieth century. 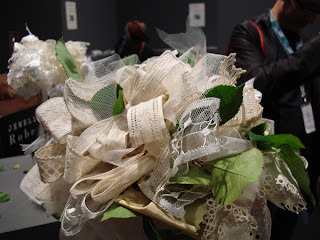 You can learn more about Margarete Naumann and her lace at this website. What I want to tell you about is the Italian interpretation of this exquisite form of Macramé because as I've told you previously, I love the Italian approach to this art which most North Americans turn their noses up at remembering plant holders and other items of the '70s made of rough jute and hemp. 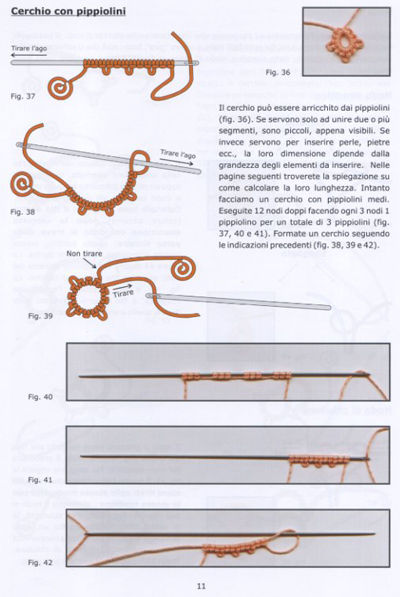 I first noticed Adriana Lazzari's work in a book that I didn't buy at the time (and still regret) called Natale Macramé which had little figures for a Nativity scene made of Macramé. She caught my attention again with a book on little Macramé angels and then I was struck hard by the cover of her latest book and knew I could fight no longer, I had to have it! "Margarete lace - what is it? It is a particular lace that derives from traditional macramé, invented at the beginning of the 1900s by Margarete Naumann and patented as "Margaretenspitze". 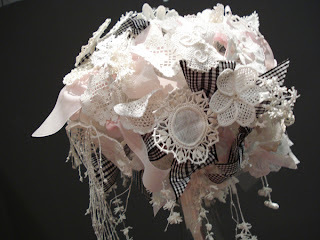 She wanted to break the bonds of the rigid knotting patterns of the time creating a particular way of making lace. This "new" technique allows one to develop the work in all directions, making both flat and three dimensional elements. 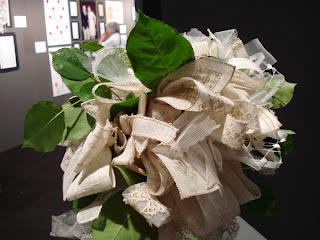 You don't need designs or patterns because, with knowledge of the basic rules you can compose the lace according to your own creativity. Gathering the threads into bundles and gradually letting them out, using simple, double, triple, quadruple and multiple knots, adding and subtracting threads during the working you have the possibility of designing modules or elements for custom making a lace personalized to your own imagination. 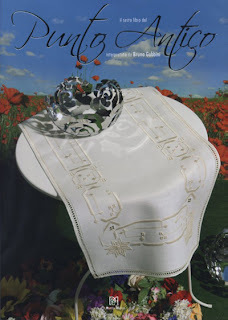 ......... A few years ago I discovered this particular lace, studying and elaborating it and now I want to pass it on to you through this book. 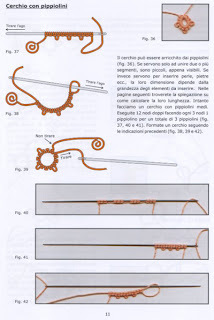 Here you will find the instructions for starting from the basics and arriving little by little to making more and more elaborate and complicated laces. I hope with this, my work, to revive this old and forgotten but always wonderful technique." The book is just under 85 pages long and the text is in Italian but there are lots of step-by-step photos and while I have not yet had a chance to try anything (I just got it!) I would venture to say that if you already have a good working knowledge of Macramé, you may have little trouble figuring it out. There are 15 projects of increasing difficulty the last of which is the design on the cover. 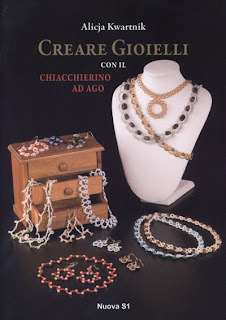 This book is available at Tombolo Disegni, look under the Libri/Books section and then under Libri/Macramé – send an email request to order. I told you a little about Byssus, called Sea Silk in this post last year, a fibre made from the Pinna Noblis now only found in Sant'Antioco, Sardinia. 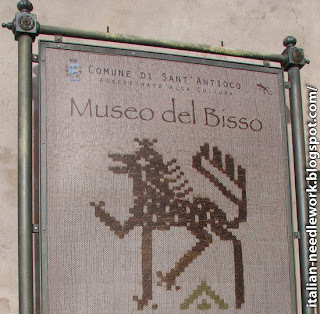 Last May I went to visit the Museo del Bisso [Byssus Museum] in Sant'Antioco and met Chiara Vigo, the last master of this ancient art. The Byssus Museum where you can find Chiara Vigo in Viale Regina Margherita, 111, Sant'Antioco, Sardinia. This video series explores the Holy Veil of Manoppello found at the Basilica del Volto Santo di Manoppello [Basilica of the Holy Face of Manoppello] in the province of Pescara, Italy. 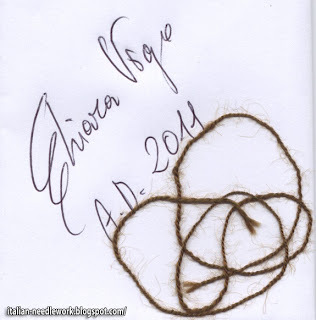 The second part of the series talks about Chiara Vigo and Byssus thread. Signora Vigo travelled to Manoppello to determine that the Veil was made of Byssus. Inside the Byssus Museum in Sant'Antioco are several areas where you can look at Byssus in it's various forms. There are displays of the Pinna Noblis, raw Byssus as it looks when first collected, the hand-spun thread, embroideries made with Byssus thread and weaving frames with fabric being woven which has Byssus designs. 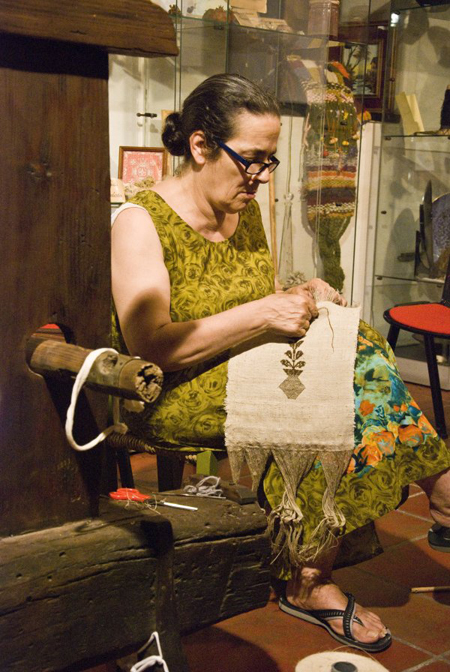 When enough people have entered the one-room Museum, Signora Vigo explains the history and the technique of collecting, processing and using the Byssus threads. This is not a commercial enterprise by any means and there is nothing to purchase. The Signora however does not keep the thread from you, she hands out raw, spun and treated thread (it must be dipped in a secret liquid of ancient formula to give it a silky soft texture) for you to touch and examine. 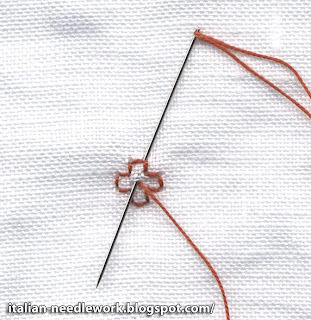 Embroideries and woven pieces are also offered for examination. Our group had people from many far away places and she gave each of us who were from other countries a length of Byssus thread and instructed us to tell people and especially children about Byssus. She promised me that if I could get a group of children to write to her from Canada, she would produce an embroidery in Byssus thread for them. The walls of the Museum are covered in letters from children around the world. Unfortunately, you cannot see the sparkle that this thread has from this scan. It sparkles like gold and changes colour depending on the direction of the light. It is so very soft and makes you understand instantly why it is called Sea Silk. Go to Roberto Rossi's website to see more great photos of Chiara Vigo, Byssus and the Museum or go to Chiara Vigo's blog to learn more. Tasteful modern interpretations of this Italian technique designed by Bruna Gubbini. This latest book is 155 pages and has a lot of designs for fun projects like box covers and needle books and more traditional fare like tablecloths but done in a completely modern way using the latest fabrics (like Graziano gingham!) and coloured threads. 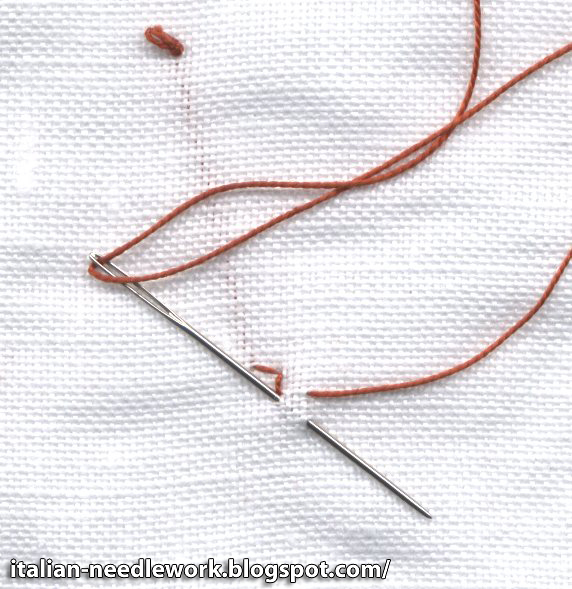 Text is Italian and English and there are many step-by-step instructions covering stitches not covered in the previous books. 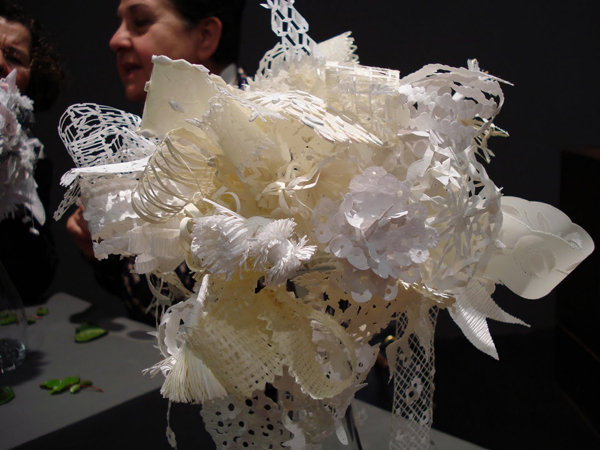 One of the elements of Signora Bruna's work which has long fascinated me is her Bullion Flower. I have tried it in the past but just couldn't get the hang of it. This latest book has step-by-step instructions and I finally managed to produce a nice one so I'm showing you how here below. These Bullion Flowers are fantastically textured and create nice little decorative elements to any work of Punto Antico. 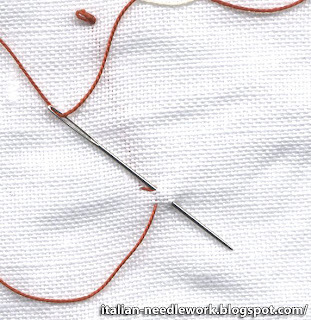 You will need a milliner's needle for best results. 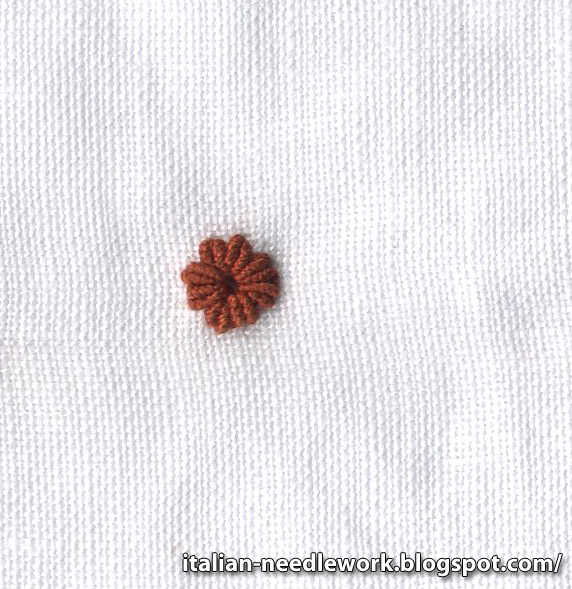 I used #12 Ritorto Fiorentino pearl cotton and some 38ct Sotema 20L Italian linen. 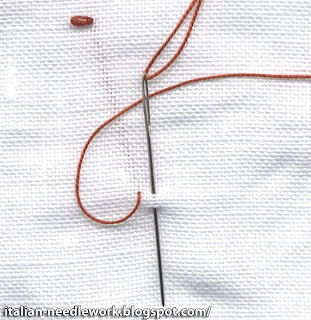 Go over 4 ground threads for each stitch. Pull a little firmly to open up small holes which you'll need later for the Bullions. 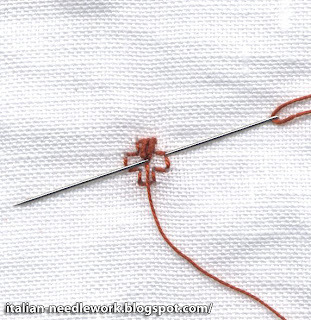 Don't pull too tightly though, your stitches should be firm and not loose otherwise they will show later. Once you get to this point, turn the work 45 degrees and continue as before to complete the "cross" shape. Each corner has two Bullions, pull tight so that they are small and the centre of the "cross" shape opens up. Working clockwise, make two Bullions on all outside corners. Not bad, Bruna Gubbini's are truly beautiful but this one turned out okay for me although I had to do a few tries to get my Bullions small enough to fit them all around the "cross" and still have a hole in the centre. What do you think? In groups they are magnificent or they can be used as the centre of a bigger Satin Stitched flower. Doing a few of them will definitely get you over any Bullion Knot fear you might have! The raised element sits very nicely on top of the fabric providing texture to your work. If you would like to read more about the author, go to Tuttoricamo and click on the British flag for the English pages, then click on "Prominent Characters", then under the "Today" column you'll find Bruna Gubbini. I watched her buying some fun fabrics at a quilting booth at the Italia Invita Forum... it make me wonder what lovely creations she'll have in her next book! This book can be purchased online directly from the Associazione Il Punto Antico's editorial website. At the Italia Invita Forum in 2009, designer Guido Fauro requested the collaboration of the lacemakers and embroiderers who were exhibiting at the Forum for help in creating two bridal bouquets, one of needlework flowers and one of needlework ribbons to go with his cut paper bouquet for his display corresponding with the Forum's theme of Weddings Italian Style. Over 50 exhibitors answered the call and produced some incredible needlework flowers and ribbons. 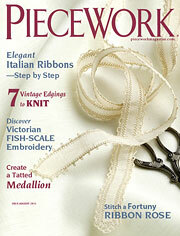 In the July/August 2011 issue of Piecework, you can find my article on these bouquets and a project of the two intricate needle lace and embroidered ribbons by the maestra Elisabetta Holzer Spinelli which were included in the Italia Invita ribbon bouquet. Many thanks to Luisa for the use of her photos! 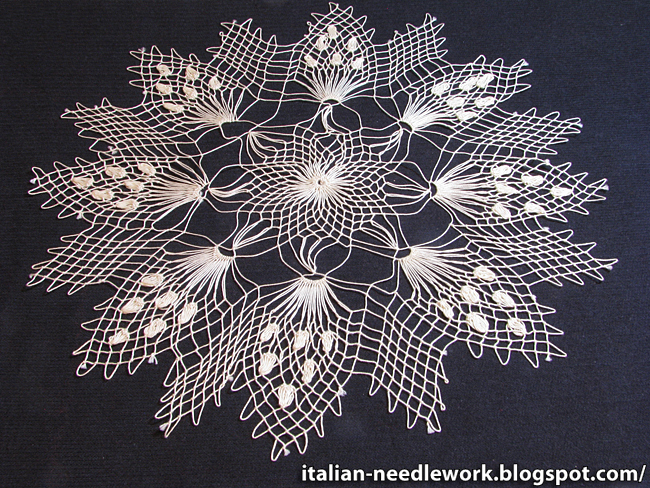 I told you about Enza Termine of Sicily and her Round Filet Netting in this post here last year but I didn't have any photos of my own to show you her exquisite work. That has changed, look what came in the mail today! 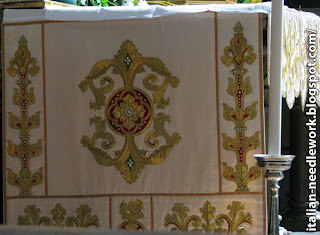 Hand-made knotted netting made with gold thread by Enza Termine. Hand-made rete a rosoni [circular netting] by Enza Termine. Today I received two pieces hand-made by Enza herself and they are marvelous! I can't stop looking at them. 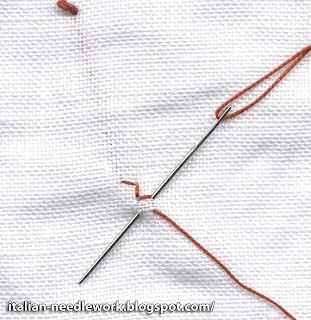 Enza has a tutorial (in Italian) on her website for the art of Round Knotted Netting, and you can find an English translation of an article she wrote on the subject at Tuttoricamo, click on the British Flag for the English pages, then click on "Techniques", then "Filet and Bosa Filet", then click on the word "circular" in the fifth paragraph. There are also some great tutorials in English at Rita Bartholomew's website here. There is a bit on circular netting here. 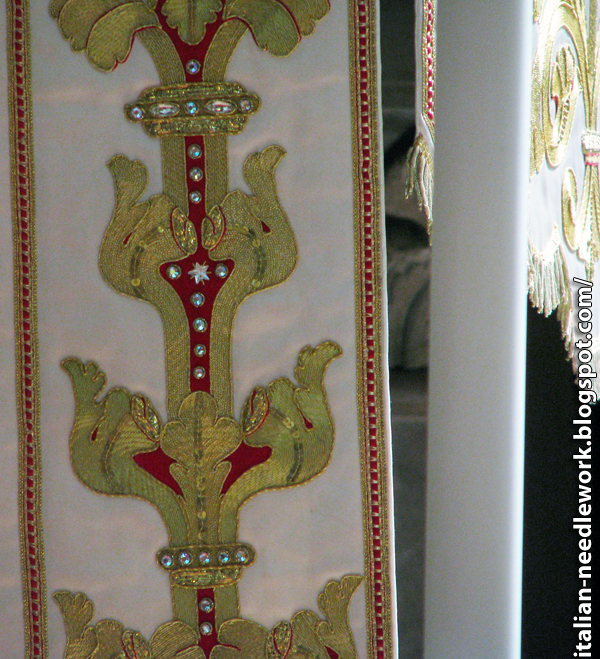 Some of the best places to see needlework when you're traveling is in religious buildings. 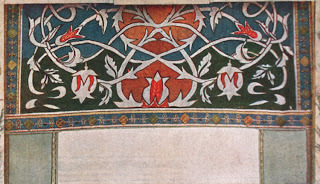 There are usually excellent examples of the best needlework as historically the Church had money to spend and the habit of conserving their embroideries well. 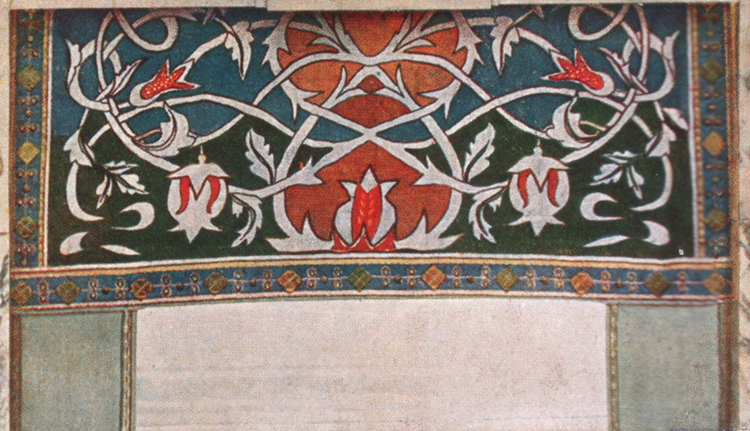 Besides couched gold threads there are also areas of raised plating to accent the turn-over parts of the leaves. Jewels and other ornaments are worked right into this amazing piece. 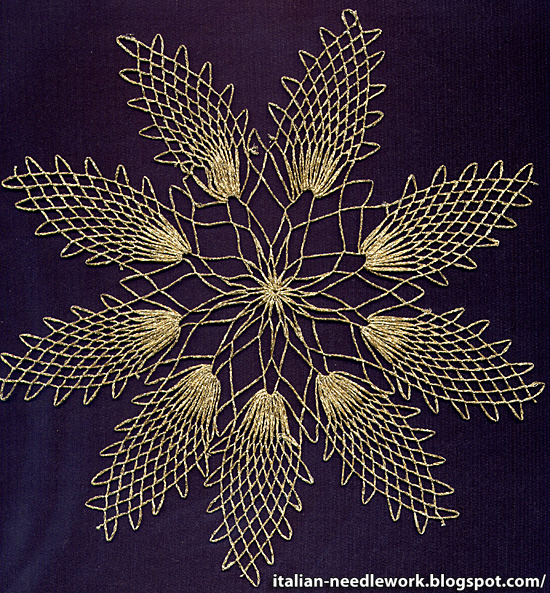 Bobbin lace at the top made of gold thread and gold fringe at the bottom! 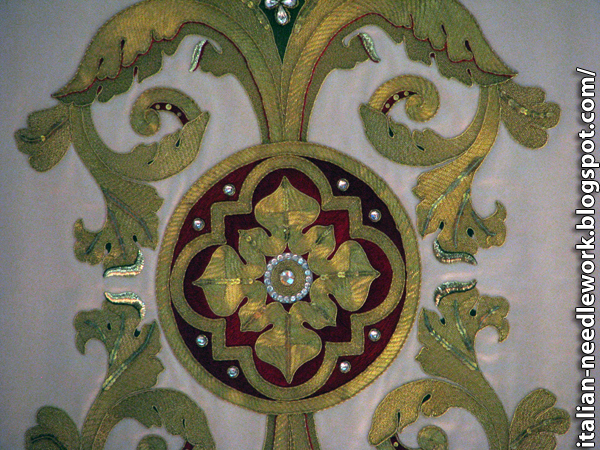 This altarcloth was a work of particular magnificence, utilizing many of the techniques and materials of Goldwork embroidery. It was so incredible and so well executed! 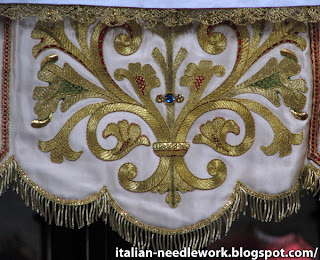 If Goldwork interests you and you're in Bologna, don't miss the opportunity to study this piece! 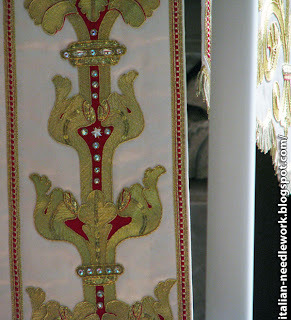 There was also a lot of other needlework on display in the Basilica, like cutwork and needlelace but we'll look at those another time. 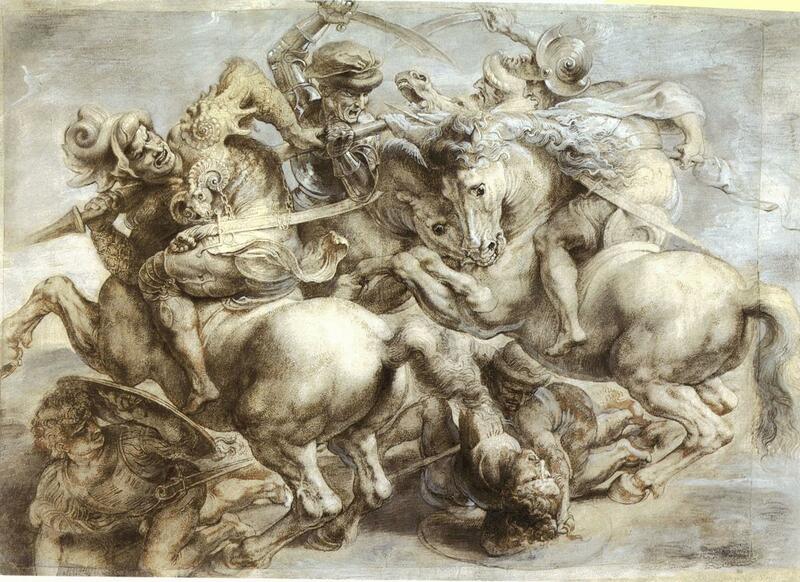 The Battle of the Standard by Peter Paul Rubens, image taken from Wikipedia. In the early twentieth century Anghiari was, like many Italian towns, participating in an arts and crafts movement with laboratories of needlework springing up all over Italy to provide women with a means to earn money and support their families. Ladies of the aristocracy promoted and supported these schools and workshops and much of the handiworks produced were exported to other countries for sale. 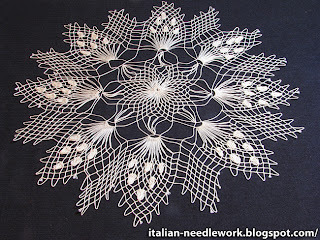 A lady from the UK by the name of Beatrice Lyle Smith living near Anghiari was instrumental in the production of Anghiari Embroideries beginning around 1901. 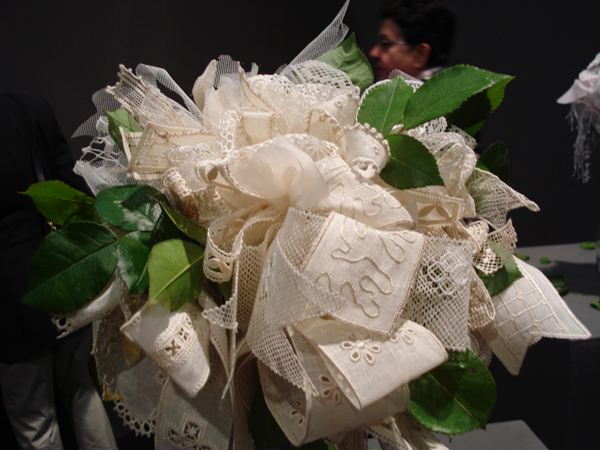 From the collection of Bianca Rosa Bellomo, Italy. 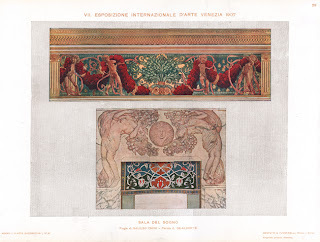 Almanacco Italiano 1904, R. Bemporad e Fo. Editori, Firenze, pg. 336. 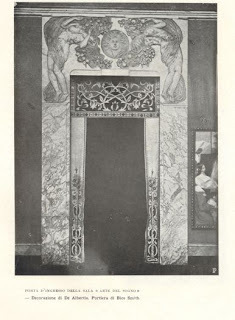 The world had already seen Anghiari Embroideries displayed at the International Exhibition of Modern Decorative Arts in Turin in 1902 resulting in a flood of orders and praise. 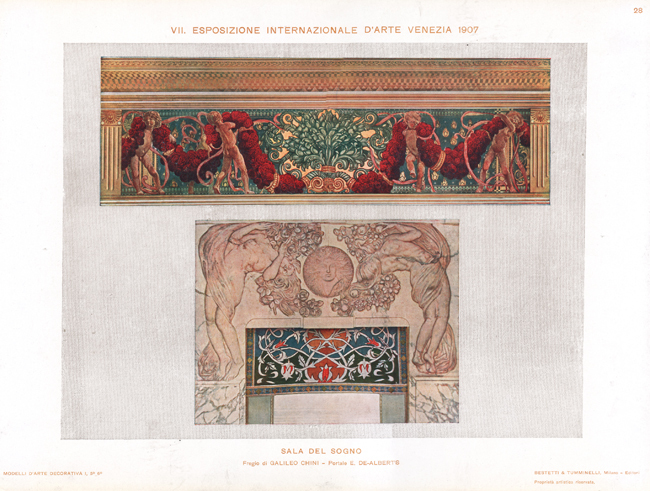 I saw the catalogue of this exposition sitting on the shelf in one of the displays in the Liberty House Museum in Chiaramonte Gulfi and begged the curators to let me look at it but alas, they refused. 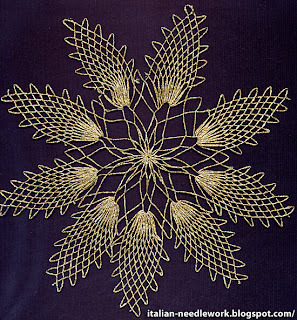 In 1904 at the World's Fair in St. Louis, Missouri "Ethle-Beatrice Smith, Arezzo", took a gold medal for hand embroidery. 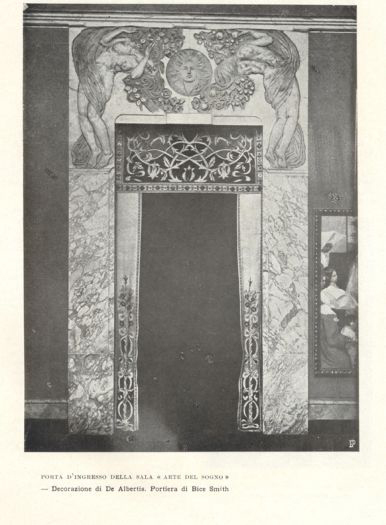 I have been unsuccessful in finding out more about this prize-winning piece, the people at the 1904 World's Fair Museum tell me it is unlikely that a photo would have been taken of it, even though it won a gold medal. 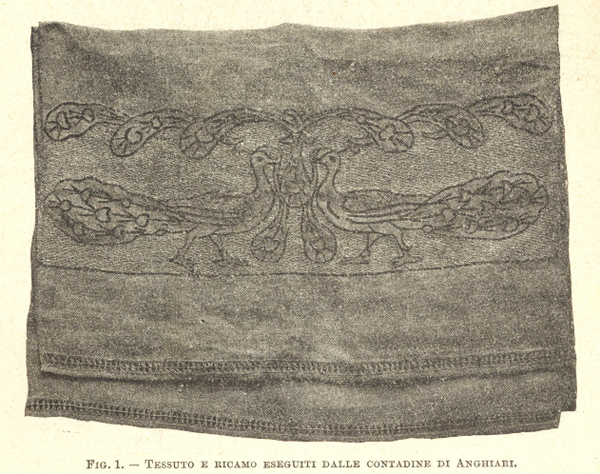 Anghiari Embroideries are mentioned in reviews of the works at the 1906 World's Fair in Milan and other international exhibitions in Europe during the early part of the 20th century. From the collection of Claudio Romeo, Italy. 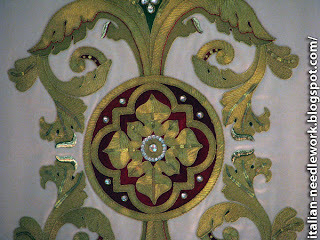 Close up detail of the photo above. From the collection of Claudio Romeo, Italy. From the collection of Bianca Rosa Bellomo, Italy. No trace of existing pieces of Anghiari Embroidery in Italy have been found, as the works were mostly made for export to the United States, I had hoped to find some examples on this side of the Atlantic, but I have been unsuccessful so far. 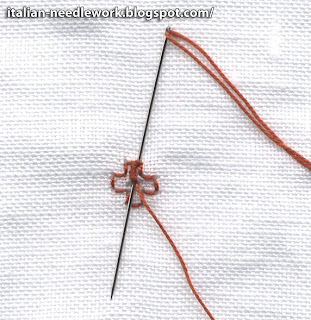 More precise information on the execution of Anghiari Embroidery and the information which has been found can be read at TuttoRicamo, click on the British flag for the English version, then "Techniques", then "Anghiari Embroideries". 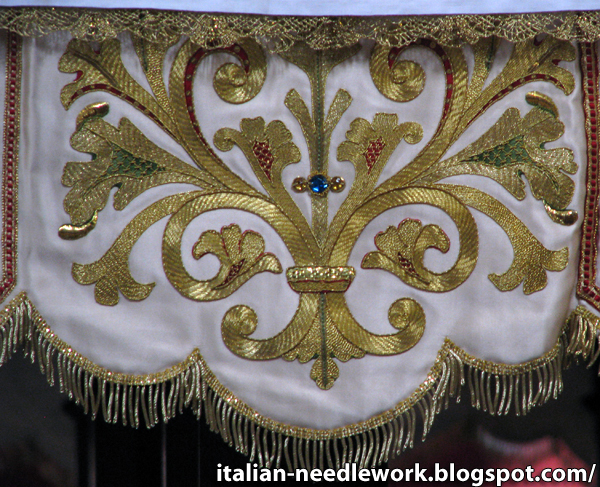 If you know anything or have seen anything of Anghiari Embroideries in the US or elsewhere, would you leave a comment below? Heartfelt thanks go to Claudio Romeo and Bianca Rosa Bellomo for permission to use their photos!